Short Review: Combat Skin have produced a range of Meerkatsu designed equipment, encompassing both nogi and gi. Their Combat Warrior grappling tights feel a little different than others I've tried before, with a 'waxier' (for want of a better word) sheen to the material, but they're still comfortable to wear: a Medium was a good fit on me (for reference, I'm 5'7 and around 66kg). They also have anti-slip bands on both the waist and ankle cuffs along with a drawstring: this is intended to keep the tights in place, but in my experience it isn't entirely necessary. However, if you've had trouble with tights slipping, you'll be able to fasten these very securely to your hips. The design is a vibrant orange Qilin from Chinese mythology, with 'Combat Skin' written down the other leg in bright yellow. Available to buy from Combat Skin here for $55. Full Review: The fightwear market continues to grow, but in a shift from recent years, the potential product line has also evolved. Previously, it would be a matter of sending off a gi design to Pakistan or China then releasing a gi largely the same as every other company, just with different patches and perhaps some embroidery. Now, it has become fairly standard to also offer rashguards and grappling tights (known alternatively as spats). I would assume those are also often made in Pakistan and China: not all of my rashguards and spats have a label stating where they were made, but of the three that do, two are from Pakistan. In November 2013, Steven Loi (possibly the same Steven Loi who runs BJJ Video Vault) officially launched his contribution to that expanding market, Combat Skin. It's a good name, bringing up associations with cool sci-fi armour from films and computer games. I first became aware of the brand due to another positive pop culture reference from my past, in the form of their 'Street Jitsu' t-shirt, paying homage to classic beat-em-up Street Fighter II. The first two points are to be expected: pretty much any business is going to want to create the best product possible and aim to deliver high quality service: if they did not, then unless they are operating a monopoly, that business would not last long. The third and fourth points are more interesting. I can't think of any other fightwear brand that has a specific goal of only using designers and artists that train. There are quite a few in jiu jitsu, so I'll be interested to see what new artists may get a chance, along with established jiu jitsu designers such as Meerkatsu and Gawakoto. Many companies claim to 'give back to the community': Combat Skin have attempted to back up their advertising copy with a charity t-shirt featuring a samurai image on the front. Combat Skin have also shown their willingness to engage with their potential customer base, using Facebook to discuss those charitable efforts. For example, for the samurai charity shirt, they first asked on Facebook if people thought it was a good idea, then went ahead and donated 20% of the t-shirt's profits to an appeal supporting the Haiyan typhoon survivors. A few weeks earlier, they announced they would be supporting the Inspire women-only open mat. I'm not sure what exactly that support involved (perhaps providing some t-shirts for the event), but either way it's a positive sign of their commitment to more than just lip service to the oft-quoted goal of 'giving back'. Finally, 'giving back' can be seen in the Combat Skin approach to sponsorship. According to Facebook, they examine several factors on top of competition results. In fact, they specifically state you don't even have to compete. That greater scrutiny of potential candidates is important, given that there are both people and whole teams out there who can prove they have plenty of jiu jitsu talent, but possess a less than stellar reputation off the mats. Moving on to the actual product, this is the sixth pair of spats I've owned. Although I only rarely train nogi, after getting hold of my beautiful Pony Club Grappling Gear unicorn spats, I've gotten into the habit of always wearing both spats and a rashguard under my gi. The Combat Warrior tights have a slightly waxy feel to the material compared to my other spats, a texture I have so far previously encountered in rashguards. That's not meant to be at all negative, I just can't think of a better word to describe it. The last time I encountered that kind of material was when I wore a rashguard Conor lent me to train nogi in Houston. While writing this review, I also received some rashguards from Odin Fightwear that felt similar. That feel could be down to the mixture of materials. 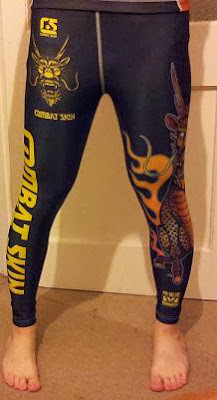 The Combat Warrior tights are 80% polyester and 20% lycra. That contrasts to the 82% polyester/18% spandex on my Strike Fightwear spats and the 80% polyester/20% spandex of my RGA Bucks Tatami rashguard. However, the Gentle Chief rashguard I reviewed a while ago has a comparable blend of 82% polyester/18% lycra, but lacks that same slightly waxy texture. I would therefore guess the Combat Warrior tights are either a bit thicker or perhaps has had some kind of treatment: either way, it's only a minor difference and doesn't affect my comfort, so I'm mainly speculating out of interest. Unstretched, the Combat Warrior spats are 85cm long and 31cm wide, but keep in mind there is a lot of stretch in them due to the fabric. They have proved to be a decent fit on my 5'7 and 66kg frame. I prefer spats to pull down past my ankles, meaning they end lower than my gi trousers. In comparison to my other grappling tights, Combat Skin fall in about the middle of the range, although those tights are in a range of sizes and indeed each company has quite different ideas of what constitutes a 'Small' or a 'Medium'. As can be seen by lining them up, the Meerkatsu 'Medium' is by far the longest, followed by the Pony Club Grappling Gear 'Medium' and the Combat Skin 'Medium'. The Meerkatsu flaming rooster bunches at my ankles as it is too long, so the best fitting spats I have are from PCGG and Combat Skin (though the larger size of the rooster spats does mean they are the easiest to put on). Like the Mashuu 2.0 spats from Strike Fightwear, the Combat Warrior tights have an anti-slip waistband, as well as smaller bands stitched to the ankle cuffs. I ended up removing the waistband from the Mashuu 2.0 and expected I'd experience the same unpleasantly constrictive feeling with Combat Skin's offering. Initially I thought my expectations had been confirmed when I heard that same ripping noise as I struggled to pull the waistband over my hips. However, while I assume that means that again the threads attaching the waistband to the spats were breaking, I think that first impression was misleading. The Combat Warrior waistband is not as tight as the anti-slip waistband in the Mashuu 2.0 and the width is also broader. The compression around the legs is a lot more comfortable than the Strike Fightwear spats, though I would assume much of that is because I opted for Small in the Mashuu 2.0 when I should have gone for Medium. It's also worth noting that I like a tight fit, so it is possible you might want to get the next size up in the Combat Warrior tights or consider removing the anti-slip waistband. The Combat Warrior tights have a drawstring in the waistband, as do the Meerkatsu flaming rooster spats I bought a few months ago. Personally, I think that's a superfluous addition in both the Meerkatsu and Combat Skin tights, but that is probably just a matter of preference. Especially with the anti-slip waistband in the Combat Warrior spats, I have had no need to use the drawstring to keep them up above my hips. I have never bothered tying the drawstring on either pair of spats and had no issues with slippage. Then again, I also haven't regularly trained with them in a nogi class, so perhaps that would pose more of a challenge. You could also argue that wearing them under gi trousers increases the friction and risk of slippage compared to nogi class. Either way, they stayed put. In terms of the chosen design, I enjoyed the vibrant sublimated graphics, a mix of orange, red and yellow. This stands out against the black, in a way reminiscent of the Mashuu 2.0. This is subjective, but I think that Combat Skin have done a better job than those Strike Fightwear spats regarding the design proportions, resulting in a sharper finish on the main illustration. In a similarly subjective judgement, I am less keen on the text dominating the other leg (as I prefer graphics to text when it comes to spats), but I do like the bright yellow colour they've chosen. Combat Skin decided to release multiple products off the same Meerkatsu concept, meaning you can kit yourself out with a whole Meerkatsu wardrobe (Seymour put up a post about it here). That includes a gi, rashguard, spats, t-shirt and shorts. The specific artwork builds on the mythical Qilin figure, explained on Combat Skin's website as having "the head of a heavenly dragon, the body of a lion, scales of a Koi fish, a tail similar to a raging bull and the hooves of a great stallion." Along with that large Qilin design down one leg, there is a Combat Skin logo on the upper right and a Meerkatsu one on the lower left leg. The spats arrived in a small display bag, with a monochrome Qilin printed on the back and a clear plastic panel on the front. Combat Skin's product description notes that these are prewashed, meaning that you can wear them straight away if you're concerned about chemicals used in the production process. 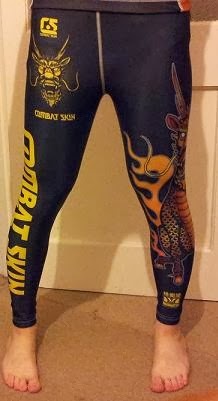 At $55, the price is close to other spats on the market: available to buy from Combat Skin here.